This TRIAC 200-watt mains-dimmable transformer is a high quality LED power supply, available in both 24v and 12v versions. The LED transformer can power up to a total of 200w of any variety of our LED tape as long as the voltage of the LED tape matches the voltage of the LED transformer; there is also no minimum load. The transformer is enclosed with a slim line design making it easy to install, and it’s compatible with Lutron, Rako, Crestron and similar lighting control systems. TRIAC (TRIode for AC) power supplies are sometimes know as phase dimmers or phase-cut dimming transformers. 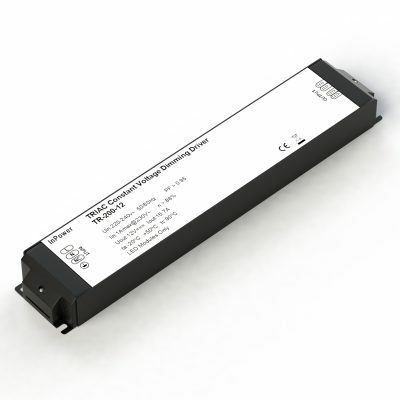 To learn more about TRIAC dimming, please see our LED dimming support page. Input voltage 100-240v AC. Output voltage 12v or 24v (2 separate transformers). This item is RoHS compliant and conforms to all UK safety standards. The 30-watt dimmable transformer from InStyle is a high-quality LED power supply, available in 12V or 24V versions with no minimum load. Because it’s a TRIAC (phase dimming) unit, it can be controlled via mains 240V dimming – using many standard household rotary dimmer switches. Also called phase dimmers or phase-cut dimming transformers, TRIAC dimmable transformers are an easy way to give your LEDs dimming functionality. This transformer can drive up to 40 watts of LED lights (make sure they match the transformer’s voltage – choose from 12V or 24V models). This 75-watt TRIAC transformer is a mains dimmable power supply, offering 0-100% smooth dimming. The slimline unit is available in 12V or 24V versions, and can be wired directly to a standard rotary dimmer switch (such as Aurora’s AU-DSP400X module or Varilight’s V-Pro series). A high-quality water-resistant power supply, InStyle’s 200-watt IP67-rated transformer is TRIAC-dimmable – driven by a standard mains 240v power supply, it can be controlled using many standard rotary dimmer switches. Very reliable, with a slimline design and mountable brackets for easy installation.